You’ve heard of podcasting. But have YOU started yet? Podcasting allows you to record your own “radio programs” and broadcast them across the globe – within minutes! They can bring you fame. They can bring you money, through sponsoring and download fees. They can boost your business. And they can rocket your career. In fact, if you’re NOT podcasting these days – you’re missing out! And wouldn’t YOU like your own online radio station? Well, now you can – with The Ultimate Podcasting Kit. Best of all, you can get up-and-running in as little at SIXTY MINUTES! Over 40 Million People Are WAITING to Hear YOU! Boost Your Career - And Much More - With Podcasting! There’s no doubt about it: Podcasting is BIG. With a single click of the mouse, ANYONE can subscribe to your radio program – and automatically receive your latest shows, ready to listen whenever they want. On a portable MP3 player. On their computer. On an iPod or iTouch. The real question is, what would YOU broadcast? You could become an online radio personality, delivering witty banter and chat via a weekly podcast show, publishing it on your website or blog. You might create a technology news show. Or become a movie critic. Or discuss self-help issues. Or create a local “What’s On” podcast for your city. Or you could interview famous people from your industry, in the way podcaster Karl Moore interviews well-known authors at Writers FM or self-help gurus at Self Dev Radio. This is your ticket to BECOMING the media! Not only that, creating your own podcast means you get greater recognition – and therefore naturally earn more money. You’ll receive more kudos in your industry, you’ll enjoy more booming business, and you’ll potentially earn big money from your podcast – through sponsorship and download fees. AND, of course, you’ll be able to say that you OWN your own radio station! Doesn’t this all sound like a pretty smart idea to you? The World of Podcasting Can Be SUPER-CONFUSING! - Let Me Show You the SECRETS to Doing It RIGHT. Podcasting should be easy and fun. If you’ve ever tried learning exactly how to record, distribute and promote your own podcast, you’ll know it’s a nightmare waiting to happen. Not only that, but most guides to podcasting are either outdated or simply don’t give you the REAL SCOOP on how to get started. Well – That’s ALL about to change. My name is Bob Ferris, and I’d like to welcome you to my site! Yes, it’s fair to say that I KNOW the podcasting world! And over the past three months, I’ve worked on creating the world’s first and only “real life” guide to podcasting. No fluffy words. No outdated websites. No unnecessary jargon. How to Get Started Podcasting, QUICKLY! – Discover how you can record, edit and launch your own podcast, in the shortest time possible. How to INTERVIEW Guests On Your Podcast – Invite famous people onto your radio show! I’ll show you precisely what to do. The TECHNICAL Side of Podcasting – Let me show how you can handle this the easy way, and how to handle it the hard way. Your call! How You Can MAKE $$$$ from Your Podcast – Covering everything from increased business, to sponsorship, to download fees! How to PROMOTE Your Podcast! – I’ll share tricks for getting you to the top of the podcast directories, and tripling your subscriber base! All inside my brand new guide-and-software package. Take a SNEAK PEEK Inside The Ultimate Podcasting Kit! In Just Minutes, With Just a PC and Basic Microphone! 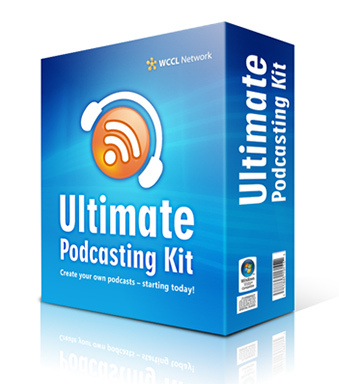 The Ultimate Podcasting Kit provides virtually EVERYTHING you need to get started creating your own podcasts. In fact, the only thing extra you’ll need is a computer, and a standard microphone. And I already know you have the first of those! Inside the guide, I’ll guide you through the entire process – starting with the basics, and stretching right through to the most advanced podcasting principles. Within an hour of reading, you’ll be ready to create your first podcast. And after you’ve finished all 110+ pages, you’ll be able to create the highest-quality podcasts possible, ready to compete with the best in the world. This guide gives you EVERYTHING. Nothing is missed out. It even includes the software you need (for both Windows and Mac computers) - and step-by-step images to help you through the process. Getting FREE Publicity for Your Podcast! – Figure out the sneaky tricks that will increase your podcast listenership, and build your popularity! The Tricks to Handle the TECHNICAL Side – Podcasting can be easy when you have the technical side sorted. I’ll show you everything! The Podcasting EXPERIENCE – And How to Sample It! – Learn how to download podcasts using podcatcher software, and much more! The THREE BIG Podcast Directories – And How to Get Listed! – You MUST be listed on these sites if you want success. I’ll guide you through it! THREE Different Methods of Recording Your Podcasts – From beginner straight through to advanced. I’ll show you the pros and cons of each! The SIX Tools You SHOULD Use When Creating Your Podcast – If you aren’t using ALL of these little-known tools, you’re missing out! What SYNDICATION Is All About – Why it’s IMPORTANT, and what it all really means! From FeedBurner, to podcast publishing sites, to RSS feeds! Finding the Perfect LENGTH and Frequency For Your Podcast – Yes, there’s a very definite rule about this. I’ll show you how to get it JUST RIGHT. How to Interview GUESTS for Your Podcast – How you should setup the recording equipment, telephone interviews, on-location interviews & more! The SIMPLE Way to Setup Phone-Ins! – Want your users to call in to the show? It’s EASIER than most people realize. I’ll show you how! The SMART METHODS of Making Money from Your Podcast! – Including how to arrange sponsorship, how to place ads, charging fees & more! My FIVE-POINT PLAN for Getting Into Directory Top 10 Lists – Follow my tips, get listed on these sites, and boost your listenership 10x over! How to Get OTHER Podcasters – To Promote YOU! – It’s easy when you realize how. Use this simple technique for some BIG boosts in traffic! ... And that's STILL only the tip of the iceberg. Would YOU like to get started podcasting – TODAY? The Ultimate Podcasting Kit Has EVERYTHING You Need! + 24/7 Help from Our Team - At Our BEST PRICE EVER! Are YOU ready to enter the world of podcasting? Want to create your own podcasts – and spread your opinions throughout the globe? Fancy owning your own online radio station – and enjoying a loyal band of followers? You’re just minutes away from making that dream a reality. With “The Ultimate Podcasting Kit,” I’ll give you practically EVERYTHING you need to get started. … INCLUDING all of the audio editing software you need to get started! All you need is a computer and a simple microphone. That’s all! So, how much does The Ultimate Podcasting Kit cost? SPECIAL OFFER: Purchase during January, and get the FULL KIT for JUST $47! That’s right. You won’t pay a penny more. PLUS, in addition to the full 110+ page guide AND the audio editing software, you’ll also receive FREE 24/7 lifetime assistance from our customer support team. Remember, you could be podcasting within an HOUR. No more confusing jargon. No more outdated Web addresses. Just pure facts – and quick podcasting. Price: $47. Approximately £30.95 or 34.95 Euros. Start Producing the BEST PODCASTS on the Web! And We'll Throw In These THREE FREE Fantastic Reports! I want you to start producing the most creative, most powerful, most professional podcasts in the industry – because when people ask how you get started, you’ll be able to send them to my site. Your success equals my success! That’s why I’ve created a whole bundle of FREE BONUS GUIDES – to ensure you REACH the TOP! But they’re only yours IF you purchase before midnight, Monday, January 28th 2019. So, hurry and grab your copy TODAY – and claim the following great guides, for FREE! THE BIG IDEA: How to Produce Sensational Shows – Looking for ideas for your big podcast show? Whether you’re discussing health or housing, entertainment or education, this guide will give you format ideas you never even thought of. It’s your handy pocket muse! Get AUDACIOUS with AUDACITY! – Audacity is the world’s most popular audio editing software. We include it with our kit, for free – and this guide covers some of it’s more advanced features, including some of it’s many special effects. An invaluable addition to your library! Remember, The Ultimate Podcasting Kit will still only cost you $47 – including the main 110+ page guide, the audio editing software, my three bonus guides, AND lifetime support from our technical team. It’s quite simply the BEST way to get started in the world of podcasting. So, are you ready to start your own podcasting adventure? Try Out The Ultimate Podcasting Kit 100% RISK-FREE! ROCK Your WORLD, I'll Refund Every Cent You Paid! Still not sure? Try it out RISK-FREE, for three whole months! I know that you’ll absolutely love The Ultimate Podcasting Kit. Which is why I’m willing to give you the entire package for THREE WHOLE MONTHS on approval. Try it out. Play around. Test the software. Create your own podcasts. See how much success it brings to you. If you aren’t OVERWHELMED by the success you have with podcasts, just get in touch after three months (and within six months) – and I’ll refund every penny you paid. NO questions asked. NO forms to fill out. NO “restocking” fees. Just three whole months to try out my guide – and if you’re unhappy in ANY way, you’ll get your money back. This guarantee is also backed by my publisher, the WCCL Network, so you can assured that your money is safe. Order Your Copy TODAY & Here's What You'll Receive! 24/7 Support & Guarantee - At Our Best Price EVER! Podcasting is the fastest growing trend on the Internet. Imagine creating your own “radio programs” and instantly broadcasting them across the globe. Imagine the fame your podcasts could bring. Imagine how they could boost your business. Imagine how they will further your career. And we’ve not even considered the MONEY you could make directly from podcasting! So, order The Ultimate Podcasting Kit today and start creating your own online radio stations in just MINUTES! creating and promoting your podcast! use to record and edit your podcasts. just like a pro. Includes my personal top ten tips! format. This is your ultimate pod-muse! the advanced Audacity features, with this bonus guide. our support gang around the clock, via myHelpHub.com. absolutely thrilled, I’ll refund every penny you paid. ... All for the TINY price of JUST $47. There’s literally NEVER been a better time to order this package. Do it NOW. I GUARANTEE that you will NOT regret it! Thanks for visiting my site today – and happy podcasting! PS. Don’t forget, our kit is FULLY UPDATED for January 2019! Most existing guides and books on podcasting are completely out of date. In fact, inside my kit, I give examples of books published this year which contain useless and outdated information. Get the latest. Get The Ultimate Podcasting Kit. Click here to purchase NOW! PPS. You can ONLY buy the full kit from THIS website! The Ultimate Podcasting Kit cannot be found in stores, on eBay, or elsewhere online. You can ONLY purchase the package from www.thepodcastingkit.com. So, grab your copy – while you still can. Click HERE to start podcasting within an hour! PPPS. Remember, this is the CHEAPEST we’ve EVER offered The Ultimate Podcasting Kit! There has NEVER been a better chance to get started with podcasting. Plus, order before midnight on Monday and you’ll also receive the three bonus guides, absolutely FREE of charge. Click HERE to grab your copy, TODAY!